Graham's friends and professional contacts plan to talk an hour or two about Graham Davies, who passed away in late June, 2012. If you knew Graham, or knew of him and would like to know more, please join us and contribute your recollections. We can all continue learning from Graham by exploring his legacy online. 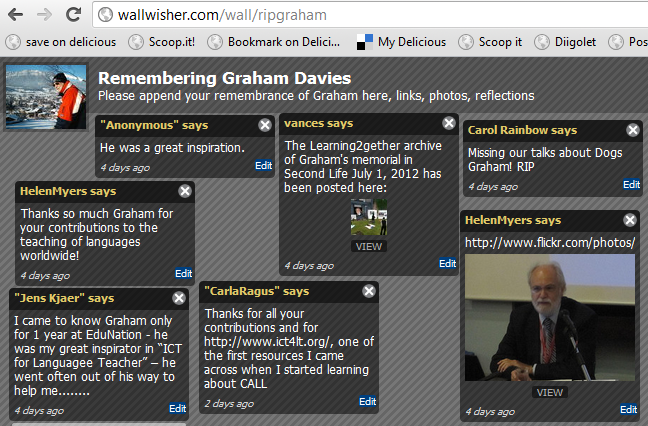 and from Heike: "May I forward to you the link for the blog and the recording of the celebration of Graham Davies' life? Some 30 friends and colleagues joined the celebration."